As I closed the door I realised that I seemed to actually resent Christmas even more than I had thought. I felt sorry for the egg man who would clearly arrive home to his wife saying “jaysus Barbara went off on a right one today”. Although maybe he wouldn’t say anything to his wife for fear he might awaken the sleeping beast with her too. But seriously, Christmas is a huge amount of hard work and yeah I do have offers of help but maybe I like playing the martyr or maybe I am a bit of a control freak but I generally do the lion’s share of the donkey work myself. Now back when the kids were smaller and I was relishing the surprising joy of being a ‘housewife’ (hate that term) I was a wee bit terrified at the thought of providing Christmas Dinner for extended family. It’s not that making roast turkey with all the trimmings is that complicated but the trick was and still is getting everything to be ready at the same time. My Achilles heel is usually getting the roast potatoes sufficiently crispy without the vegetables going soft. Actually I have two Achilles heels. The other is that every year I make two puddings – because I LOVE Christmas pudding but also, because, until last year, I always burn the arse off the first one. Then someone gave me the secret of placing a saucer under the pudding bowl – who knew? No more horrible smell of melted plastic in the kitchen followed by hours trying to scrape said stuff off my best heavy bottomed saucepan. Anyway, by the time I actually get to eat my pudding I am red faced, in a sweat and completely exhausted and only slightly inebriated. Everyone else is merrily pulling crackers, well pissed and completely oblivious to my pain. But I hate that I am beginning to be known as a Christmas Grinch. “Oh Barbara, she hates Christmas” people say about me. But it’s really only the Christmas dinner shenanigans I hate. I love Christmas carols, I love cold crispy weather, I love the smell of a Christmas tree and the twinkle of the lights. So this year I am going to attempt to make life a bit easier for myself. I am going to buy as much pre prepared stuff as I can. There is a voice in my head that says “ah but that’s cheating and not very traditional” but feck that. I want to sit down without a red face and with enough energy to pull crackers with everyone else. And the good news is that all the supermarkets are full of great ready prepared vegetables and prepared meats to make our lives easier. 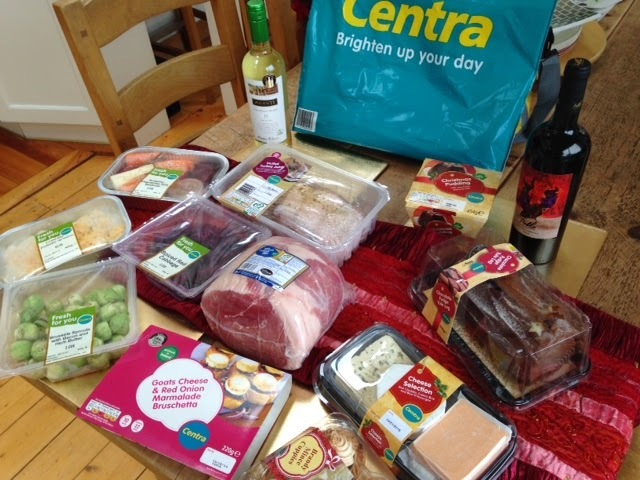 The good people at Centra let me have a look at what they have in store to help a tired housewife like me enjoy Christmas more. It looks like heaven. From boned and rolled turkey (who needs turkey wings anyway), and ham joints to potato gratin and spouts with bacon. They also have desserts and party food and cheese boards. All the hard work done. Oh joy of joys. I no longer need to prove I can cook a Christmas dinner for ten. Been there and done that too many times. No this year I am taking it easier and letting Centra do the heavy lifting. I can’t wait to tell the egg man!!! Now, where’s that recipe for Mistletoe Mojitos?